I believe "kav" is literally guarding the nation's borders and taking part in the routine operations in the West Bank. Hey Marissa is right, we need something intersting and cool to read at work. Keep writing! Hi!! My dad is good friends with your dad and sent me the website to your blog through my e-mail at school. I'm an anthropology major and loved reading your blog! Congratulations on movin' on up! Keep up the hard work! Humph. When I did basic back in '77 it was considered basic for the full six months, with the distance and punishments and all. Golani must be getting soft. US Army basic was tough, but you may be overestimating how tough. Same ridiculous discipline I read in your posts is what I saw in the US Army. One thing that does surprise me, though, is how dirty those weapons are in the picture you're showing. That would definitely get someone smoked (read pushups) in the US Army. 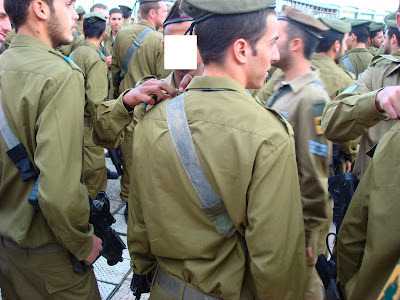 Also, the personal appearance of some of those soldiers (not shaven) is surprising; although I know there are more lax personal appearance standards in the IDF for religious reasons vs. the US Army or USMC. I'm sure basic is tough for anyone in any army. Basic is a joke once you get to advanced training, however. But, this blog was live, so it was how I saw it at the time. There aren't lax shaving standards. Those guys either have medical or religious exemptions, and the only way to get either is by permission from a professional in either field (skin doctor or rabbi). Their guns are dirty because we just finished a week in the field and an all-night march and then had the ceremony a few hours later. If a gun isn't clean during a check, you get your weekend pass taken away. Sorry to have offended you. It's just a blog, bud.